Citi Plaza is located in the heart of downtown London, Ontario and is accessible by vehicle, London Transit and within walking distance to the City’s VIA Train Station. Citi Plaza has parking capacity for approximately 1,500 vehicles. 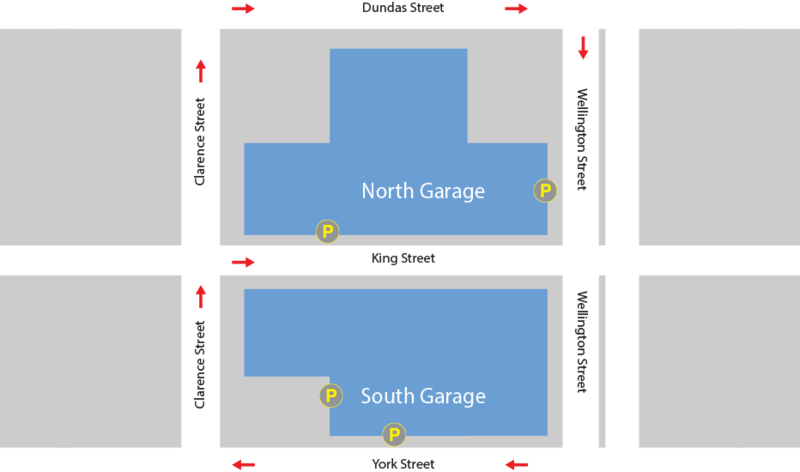 Entry to our covered parking lots can be accessed via Wellington, York, Clarence or King Street. For further information regarding monthly parking or for general inquiries, please contact Impark, the manager of our parking. The Parker Pete motorist assist program is available when parking at select Impark lots where the Parker Pete sign is displayed. This program provides timely service response to Impark customers needing help with their vehicle while using our facilities. Should you need assistance, simply call us toll-free at1-877-771-PETE (7383) – or the number as posted on the lot. All calls received will be coordinated by our staff – with service performed by an authorized third-party. Citi Plaza has Two (2) loading docks for tenant and potential client use, if need be. The North Dock can be accessed by travelling south on Wellington. The South Dock entrance can be accessed off of King Street. In both loading docks, there are freight elevators that serve all floors. The role of Security Service at Citi Plaza is to provide a safe and enjoyable environment for our tenants and customers. The security department patrols Citi Plaza 24 hours a day, 365 days a year. The security office is located on the first level, south side near the York Street entrance. Uniformed, licensed, and radio equipped male and female Security staff patrol the mall providing a security presence and offering assistance, as required. Providing first aid for any injuries or illnesses. In addition to patrolling the centre, our Security Service also patrol the parking lots and outer perimeter. These patrols serve to deter crime and identify suspicious behaviour. There is also a Security Dispatcher working 9am-7pm who is responsible for monitoring the closed circuit camera system which observes the interior and exterior of the Centre, as well as answering all incoming telephone calls for Security assistance. Calls for assistance are dispatched to the appropriate Security personnel. Our Security Service act as an important link with the London Police Service and other emergency services that may be required at Citi Plaza. In order to further protect visitors to citi Plaza, the Centre acquired five (5) Automated External Defibrillators (AED's) and all members of the Security Service are trained in the use of these life-saving cardiac devices. All security personnel are also trained in First Aid and CPR. In order to provide an enjoyable, safe environment for all, we ask that all of our guests conduct themselves in a respectful way in accordance with the following Code of Conduct and all laws and ordinances. Disruptive behaviour, which may interfere with the enjoyment of the facilities by other patrons and tenants both inside and outside of the Centre, is prohibited (including but not limited to: running, horseplay, fighting, using profanities, skateboarding, rollerblading). No riding of bicycles in Centre, carrying bicycles up/down escalators or parking bicycles in Centre corridors. No Loitering (standing or waiting idly for more than 1 hour without apparent purpose) in the Centre corridors. Congregating in large groups so as to interfere with Centre traffic is prohibited. Centre property such as: tables, chairs, trash containers, etc. are not to be used for purposes other than their intended use. Wearing of gang colours or paraphernalia: including bandanas, and wearing of inappropriate clothing slogans is prohibited. Taking of photographs or videotaping without prior permission from Centre Management is prohibited. Restricted areas of the Centre (i.e. back corridors) are off-limits unless prior permission from Centre Management has been given. Playing of radios or other audio devices without prior authorization from Centre management is prohibited. Motorized scooters are to be properly insured and operated at a safe speed. Driver should also be in care and control of the vehicle at all times. Storage of vehicles without prior permission of Centre management is prohibited. No distribution of flyers or other literature, or solicitation of products or services in the Centre or parking. No smoking, drug use, consumption of alcohol in common area, carrying of weapons or any act that violates Municipal, Provincial or Federal Laws. Safe use of escalators shall include: children being accompanied by an adult while riding, stand on steps holding hand rails at all times. No large items such as: strollers, carts, boxes shall be carried up/down the escalator. Citi Plaza is fully accessible for customers using wheelchairs or walkers including the washrooms located beside the Food Court and on the Third Floor in Wellington Square. There are a number of reserved handicapped parking spots close to centre entrances. Public washrooms are located on the south side, lower level beside the Food Court. Our large modern washrooms feature “no-touch” sinks, toilets, soap dispensers and hand dryers. The washrooms are wheelchair accessible and feature baby changing stations. Elevators are located on the south side and north side of Citi Plaza and are accessible from both the south and north parking garages. All of our elevators are AODA compliant. To help you with your banking needs, ATM’s are located on the north side at the CIBC bank.